Goo Gone is the most innovative and effective method of removing a wide variety of the most common (and uncommon) "sticky" problems. Goo Gone is a combination of citrus power and scientific technology designed to eliminate the very toughest gooey, sticky, gummy and greasy problems (It is not petrol based like some other products which can often do more harm than good. Nothing is more effective than Goo Gone when it comes to removing the residue left behind by self-adhesive labels. Why Not Take A Look At Some Of The Common Questions People Have About Goo Gone and Then Consider For Yourself How You Would Use It? Can I use Goo Gone to remove tar, stickers, grease off my car? Goo Gone is safe on your car exterior, using instructions for hard surfaces. It's safe on your upholstery and carpeting, using the instructions for carpeting. It's safe on the vinyl and glass, but may remove the tint from the tinted side of windows. How can I remove lipstick, tar, grease from my carpet? Use Goo Gone, but use it properly. Goo Gone is an adhesive remover and, if used improperly, it can remove the adhesive that affixes the carpet fibers to the backing. Therefore, don't pour Goo Gone into the carpet. Put some on a clean, white rag and work the grease out, changing the rag surface periodically. When you're done, wash the carpet area with soap and water and rinse well with clean water. Chewing gum got all over my clothes in the dryer. Help! You'll have to treat each gum area separately, and let the Goo Gone work for 20 to 30 minutes. Then wash no more than a few pieces of clothing at a time in the washing machine, thereby allowing the articles free movement. Check them before putting them back into the dryer. Use Goo Gone on a rag to clean the dryer, drum, and rinse. Can I use Goo Gone to remove melted candle wax from my fine furniture? Absolutely. Just follow the instructions for hard surfaces. Then wipe it clean and top with your usual furniture polish. How safe is this product? It says "combustible." Combustible means you'd actually have to heat the Goo Gone to a temperature of 133°F and use a match to ignite it. Flammable means it would burn if you put a match to it at room temperature, and Goo Gone is not flammable. It's safe to clean your dryer drum and your oven... just wash with soap and water when you're through. How safe is this product? Why don't you put a child-proof cap on it? Goo Gone has been proven safe, in that it is orally non-toxic and non-irritating to eyes and skin, according to The Federal Hazardous Substance Act. It contains no hazardous air pollutants or ozone depleters. However, it is a chemical and should be respected as one, and kept out of the reach of children. Older children can be supervised and taught to respect Goo Gone just as they would a fruit-scented bath soap or candle. Is Goo Gone safe in my septic tank? The small amounts of Goo Gone entering a septic tank will not alter or otherwise affect the natural biological activity of the system. Eventually the chemicals will biodegrade or evaporate. Can I use Goo Gone to remove gum from my daughter's hair? Goo Gone is safe on hair, but we prefer that it not be in touch with her scalp. If you have to get close to the scalp, we recommend you use our Goo Gone Hand soap, available in most national-chain hardware stores. Is Goo Gone safe on skin? Safe, but avoid open wounds and wash with soap and water afterwards. Avoid prolonged contact with fingertips and under fingernails. Wear rubber gloves when using Goo Gone for long periods of time. On what may I not use Goo Gone? Non-washable fabrics, such as silks and satins, and natural materials, such as leather, suede, and rubber. It's not for photos, as it could damage the emulsion on the paper and be absorbed by the paper, leaving a yellow tint. I used Goo Gone on my windows and now it's all smeary looking. You're not finished with the job. Goo Gone dissolved the adhesive, and you smeared it around on your window. Now take another clean, dry cloth with more Goo Gone and remove what's there. Can I use Goo Gone to remove the safety treads from my bathtub? Yes, but realize the treads are plastic, and the Goo Gone has to touch the adhesive underneath. It would be best to pull off what you can, and apply Goo Gone directly to the remaining adhesive. Let it sit for a while, and go back every now and then to see what's been loosened. Don't allow Goo Gone to dry or evaporate; keep putting it on the adhesive and be patient. Wear rubber gloves to protect your fingertips. Will Goo Gone remove paint? Goo Gone will remove those accidental paint messes if you get them before they're thoroughly dried - so that's good. However, if your budding artist drew on the walls with crayon, the Goo Gone will remove the crayon without ruining your paint - so that's good. Can I dilute Goo Gone to make it go further? 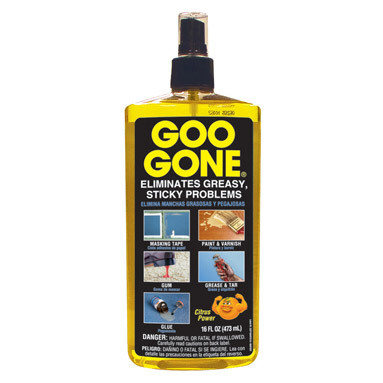 Goo Gone is an oil-based product, used to dissolve icky, sticky, gummy, gooey messes, and can't be mixed with water. If you need an all-purpose type of cleaner, we recommend our water-based Goo Gone All-Purpose Cleaner, which can be used full-strength on many cleaning projects and diluted to wash large surfaces. However, the two products are not interchangeable. My dog got into some tar. Can I use Goo Gone on his fur? While we do not officially recommend Goo Gone, we are aware of its use to remove ink and tar from pets and by veterinarians to de-oil birds. Be careful with the animal's eyes, and wash it off thoroughly afterwards. And remember, Goo Gone Hand Soap is perfect for our furry friends. Is it okay to use Goo Gone on scuff marks on my wooden floors? On vinyl floors? Yes for any floor, but Goo Gone leaves a slippery surface, so wash with soap and water afterwards.